In March of 2013, Confucius Institute Headquarters (Hanban) approved DLUFL's application of opening Confucius Institute of University of Guyana. On November 7th, 2013, DLUFL and University of Guyana signed an agreement. 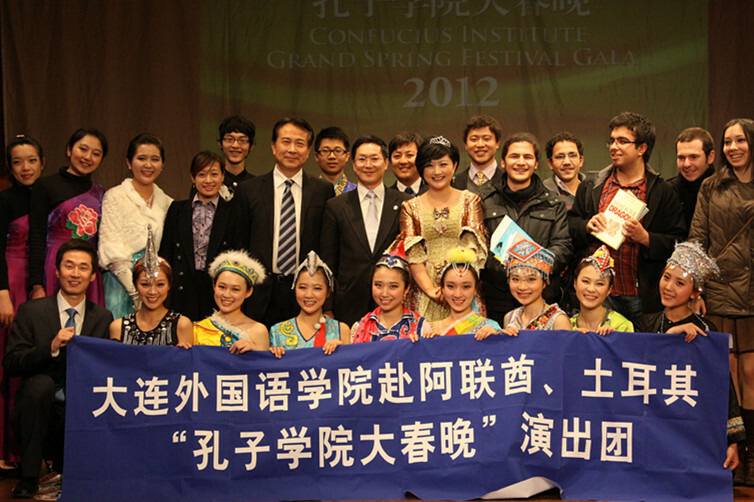 On May 19th, 2014, the opening ceremony of Confucius Institute of University of Guyana was held in the educational lecture hall of the university, attended by over 100 persons including the Guyanese PMota, Premier Hinds, Minister of Culture Anthony, the Chinese Ambassador to Guyana, Zhang Limin, Counsellor Ouyang Jun, former DLUFL President, Sun Yuhua, President of University of Guyana, Jacob, international ambassadors to Guyana, representatives of local Chinese enterprises, students and faculty of University of Guyana, and Chinese living and working in Guyana, and journalists, etc. In September of 2016, the Institute cooperated with Ministry of Foreign Affairs of Guyana to open Chinese language training courses for government officials for the first time in history. The 46 trained officials came from many departments of the Guyanese central government such as the offices of the president and the premier, ministries of foreign affairs, commerce, education, culture, departments of immigration administration, police, public security, information and communications, and the office of the council, etc. The Institute now has not only Chinese language courses for students of different levels, but also rich cultural experience activities, winning wide popularity among people in Guyana.